The classic tarte tatin is made, of course, with apples. But the principle of caramelising some delicious, round, sweet things, topping them with puff pastry, then flipping it upside down, works equally well in this savoury interpretation. The shallot/spring onion vinaigrette finishes off the tarte a treat – but, if you fancy ringing the changes, it’s also very good topped with crumbled feta and coarsely chopped parsley. The classic tarte tatin is made, of course, with apples. But the principle of caramelising some delicious, round, sweet things topping them with puff pastry, then flipping it upside down, works equally well in this savoury interpretation. Heat the oil and butter in a frying pan large enough for all the beetroot to sit snugly, add the beetroot and toss to coat in the oil and butter. Add the sugar and vinegar, season and taste, adjusting the vinegar and sugar if necessary. Cover the pan with foil and place in an oven preheated to 190°C for approximately 30-40 minutes or until the beetroot are tender. Mix the flour with the salt and add the cubed butter. Add enough water to bring the mixture together into a fairly firm dough. On a floured surface shape the pastry into a rectangle. Roll out the pastry until it's approximately 1cm thick. Fold the pastry into thirds, by taking the end furthest away from you towards you and then the end closest to you on top of that, you should again have a rectangle. Turn the pastry a quarter turn and repeat the rolling and folding a further five times. Wrap the pastry in cling film and rest in the fridge for 30 minutes. 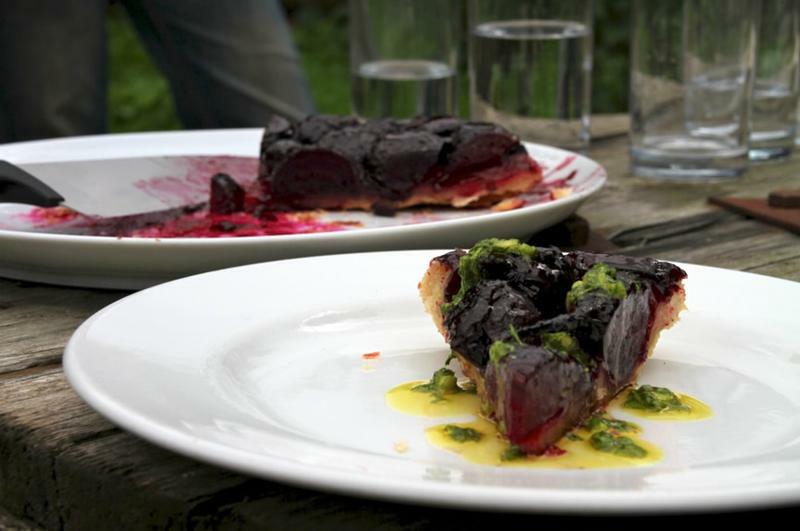 When the beetroot are cooked remove from the oven and arrange the beets neatly in the pan. Roll out the pastry and cut a circle a little larger than the pan. Carefully place the pastry over the beetroot tucking the excess pastry into the pan. Return to the oven and cook for 20-25 minutes until golden and puffed up. To serve place a large plate over the pan and carefully, but quickly, turn upside down remove the pan and pour over the vinaigrette.